With its tropical climate and breathtaking shores, the island of Lampedusa may well be described as an idyllic paradise, somewhere off the Italian mainland in the Mediterranean Sea. Contrary to this blissful image and as far as human rights and immigration are concerned, however, Lampedusa has become Europe's shame. 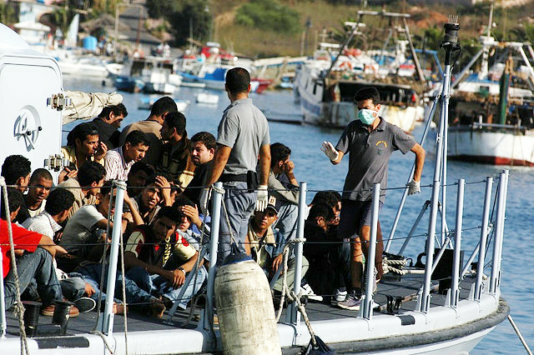 Since the 2000s, the Italian island has become a popular EU entry point for African migrants, who risk their lives on highly dangerous and strenuous journey by boat in order to seek a better life abroad. A look at a simple map reveals why Lampedusa, among other destinations such as Malta, is one of the main gateways into Europe for migrants from countries such as Tunisia or Libya. Geographically, Lampedusa is situated much closer to North Africa than Italy itself; Tunisia being only 115km away and Sicily almost 180km. According to Amnesty International, around 1,500 people have died trying to reach Europe via such gateways in 2011. "The EU is failing these migrants- European countries must make concerted efforts to prevent deaths at sea by stepping up capacity and coordination for search and rescue operations", said Nicolas Beger, Director of Amnesty International's European Institutions Office. Human Rights organizations are not the only critics of the current circumstances. Following a powerful radio appearance last year, Lampedusa's fierce new mayor, Giusi Nicolini, released an open letter to the European Union that addresses these issues. "I was elected in May  and on 3 November  already 21 cadavers were consigned to me. These are people who have drowned while attempting to reach Lampedusa and for me this is something that is unbearable. For the whole island of Lampedusa this is an enormous burden of grief. Going through the Prefecture, we have had to ask help from the Mayors of the province so as to be able to give a dignified burial to the last eleven people, because our cemetery had no more available space. We will create more spaces. But I wish to ask everyone this question: how big does the cemetery of my island have to be?" Ms. Nicolini goes on to say that the deaths of those who lost their lives at sea, trying to escape their home countries, are a "reason for Europe to feel ashamed and dishonoured". "I am outraged by the normality that seemed to have spread to everyone like an infection. I am scandalised by the silence of Europe that has just received the Nobel Peace Prize and yet is staying silent in the face of a massacre that has the numbers of a true war." The mayor's bold stance on Europe's immigration policies and its treatment of migrants also brings a closely related issue to the discussion. As fairplanet.net reported previously, those migrants who make it to Europe and get an official refugee status often live under despicable conditions in overcrowded asylum centers, and are hindered by extremely restrictive laws - depending on their country of residence. If the European Union wants to honour its title as Nobel Peace Prize laureate, all member states should reevaluate their stance on immigration and migrant treatment - sooner rather than later. In other words, how big does Lampedusa's cemetery have to get, before something is done? Read Giusi Nicolini's full appeal here.